Synthetic peptide: RRTQKSSLFLPRVL. FGF3 conjugated to BSA, corresponding to amino acids 170-183 of Human FGF3. Our Abpromise guarantee covers the use of ab10830 in the following tested applications. ICC/IF: Use at an assay dependent dilution. Fixation in 4% paraformaldehyde in PBS for 20 min. WB: Use at an assay dependent dilution. Predicted molecular weight: 29 kDa. Fibroblast growth factors (FGFs) can stimulate the proliferation of mesenchymal, epithelial and neuroectodermal cells. FGF3 belongs to the heparin binding growth factors family. Members of the family include Acidic FGF (also known as aFGF or FGF 1), basic FGF (bFGF or FGF 2), FGF 3 (also known as Int2) and FGF 4 (also known as hst or Kaposi FGF). FGF 4 was first revealed to be an oncoprotein in Kaposi's sarcoma cells. Other family members include FGF 5, FGF 6, FGF 7 (keratinocyte growth factor, KGF), FGF 8 (AIGF), FGF 9 (GAF) and FGF 10. FGF3 is activated by proviral insertion of mouse mammary tumor virus (MMTV). FGF3 is responsible for most of breast malignancies. Publishing research using ab10830? Please let us know so that we can cite the reference in this datasheet. Thank you for you reply. Interestingly, as I have said in my original request to you for information, there is no mention whatsoever of FGF3, or Abcam in the paper that you quote. Could I suggest that it is misleading of Abcam to suggest that this is so? As a customer of Abcam, having bought an antibody which you sell as 'for IHC', only to be told that you have no idea of a ball-park concentration for it's use. Is it possible that this antibody has never been used for IHC? I would expect to have to contact the scientist you suggest, if I had received the antibody from their lab as a gift. I bought this from you and therefore my redress is with you! I have set up an IHC experiment with this antibody at a range of concentrations, fortunately I have a positive control tissue which will allow me to validate this antibody. This seems to be a rather odd sort of customer support, and somewhat creative product advertising. Thank you for getting back to me. I appreciate your frustration. Please let me apologise for the lack of a recommended dilution for this antibody by immunofluorescence and the cited publication which I conceded does not reference this antibody. I have updated the datasheet with the correct reference: Antoine M, Daum M, Kohl R, Blecken V, Close MJ, Peters G, Kiefer P. NH2-terminal cleavage of xenopus fibroblast growth factor 3 is necessary for optimal biological activity and receptor binding. Cell Growth Differ. 2000 Nov;11(11):593-605. PMID: 11095248 In the reference they refer to the antibody as "MSDI" as this precedes the sourcing of this antibody by Abcam. I have emailed this paper to you as a follow up e-mail. According to the reference that I have been supplied with this antibody was tested using paraformaldehyde fixed cos-1 cells. Therefore the antibody is yet to be tested using IHC. That is not to say that it will not work, just that it has not been tested. I am pleased that you are able to optimise this antibody by setting up a range of concentrations. However, should you have difficulties with this antibody please do not hesitate to get back in touch with us. I appreciate your patience in this matter and wish you best of luck in your research. I would like to use this antibody (ab10830, FGF3 mouse monoclonal) for IHC on paraffin sections - any idea of a ball park concentration to try? There is no mention of suggested concentrations that I can see anywhere and the paper that is supposed to have used this antibody that is cited, does not appear to mention it!!!! Thank you for your enquiry. I am sorry but we do not have any further information as to a recommended dilution for this antibody. I would like to recommend that you contact Michael I Koukourakis given that they applied this antibody. According to the following publication he can be contacted on: targ@her.forthnet.gr Giatromanolaki A et al. DEC1 (STRA13) protein expression relates to hypoxia- inducible factor 1-alpha and carbonic anhydrase-9 overexpression in non-small cell lung cancer. J Pathol 200:222-8 (2003). PubMed: 12754744 I am sorry that I cannot be of more assistance on this occasion. Thank you for your enquiry and your patience in awaiting a response. 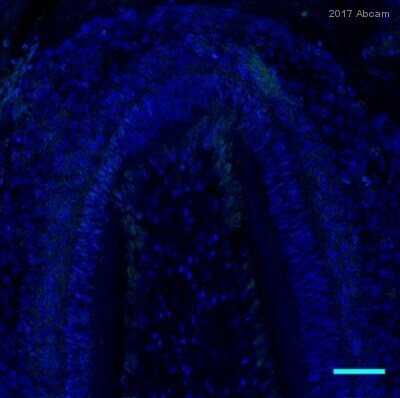 Unfortunately, we are not aware of a tissue that expresses reasonable levels of Fgf3.The antibody has been tested on whole embryos, as they express Fgf-3 (as determined by in situ) at several sites but were never able to obtain convincing results. It is generally not expressed in adult tissues. Therefore, I think the only control would be recombinant protein. If you need any further assistance please do not hesitate to get back in touch with us.